Recently I realized that there are many questions regarding my “Develop your own Magento mobile application” article, and many new articles need to be written to answer them all properly and to guide you further through developing this kind of an application. That is why I would like to present you an Android application, developed for the purpose of utilizing Magento’s XMLConnect and exploring possible modularity of the future application – mainly only a concept. Let’s take a look at it. While examining folder structure you may notice that project is divided into several packages. 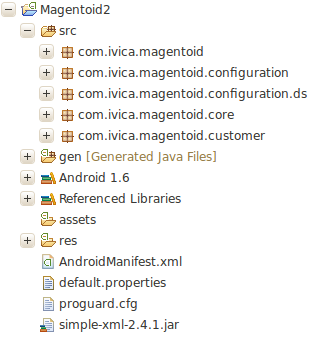 Also, very important is the imported java library SimpleXML, we’ll go through it in a bit. The main idea was to develop an app that will hold all the essentials for communication with a Magento store, handle persistency (session) and provide tools for caching. Not all is yet developed (like caching), but this alone will give you more than enough to start your own project. I believe code is a good enough documentation itself so I won’t go into too much detail here, but would like to talk about deserialization and datasets, crucial for mobile app – Magento store communication. Parsing XML data is something most developers, including myself, do not enjoy one bit. There are various approaches to parsing, but I wanted not to think about plain string and wanted only to work with solid objects. That’s where SimpleXML, a great serialization / deserialization library, comes handy. Basically, SimpleXML provides a serializer class witch you feed with your (dataset) class and an input stream (string) for parsing. As a result it returns a new object based on the class you provided and populated with data from the provided stream. What is and how to create a dataset class? To put it simply, a dataset class is a plain java class with fields which are supposed to store values from an XML string, and with annotations all over the place which tell SimpleXML serializer how to do it. I won’t go into details about SimpleXML annotations here because it’s a story for itself, but you may find out on its site that it is pretty well documented. As a result we see an entire application configuration as it is setup in Magento admin, in an XML format. This is what we feed our serializer with. Now, if you run the app you will see a copyright message popping up in a Toast, as it is set in your Magento store. I hope this will answer some of your questions about the subject and help you with your project. I am new to magento, i have worked bit on web view, but now i would like to build a mobile app. Can you please help me, how should i go step by step for android and iOS. Do i have to buy some extensions from 3rd party? I am developing the android based magento app and I am facing the issue with the cart items. When I am trying to get the cart information with cart item from the android app, cart items are blank and if i am checking the same thing from from the browser it’s working fine. So can u provide me the solution. I have mae the different services for getting the data from magento as what magento has done in it’s xmlconnect module. I have a magento e-commerce store and now i want to develop mobile app for it. So i wanted your suggestion on this that how should I proceed. Could you please tell me step by step process of creating magento mobile app for my web store. Eagerly waiting to hear from you. Could you please help me with the steps. I have same query. We developed a really beautiful and robust Magento extension and would like to hear your feeback on it. You can download the free trial to test it out. We are looking for integration partners and affiliates. How to get Product List using Xml Connect . What we do for downloading prodcuts with all informations. Is it still working ? Some one help me to study Magento technology ? Please let me know the books names , web sites name , etc . Thanks for the great post. Any chance there might be a boilerplate for iOS? Please can you tell me why i couldn’t get the same result : the footer is not displayed ( copyright ). That\’s not just logic. That\’s really senilbse. I don’t see why not. Key license of Magento Mobile is for the iPhone, iPad and Android *native app* itself. Here we are not dealing with Magento Mobile, but with XMLConnect – an extension that serves Mobile and is open and free for everyone to use. I’m a litle bit confused. Can magento developers use xmlconnect to build their own mobile app without paying key lincense of magento mobile ? When it comes to utilizing the XMLConnect, it’s basically the same story with iPhone or Android. Thanks for this post Ivica… very interesting. While I’m not currently looking at Android, I am working on some ideas for an iPhone app and I would imagine some of the principles are the same with utilising the xmlconnect.